The Independent State of Croatia (Croatian: Nezavisna Država Hrvatska, NDH; German: Unabhängiger Staat Kroatien; Italian: Stato Indipendente di Croazia) was a World War II puppet state of Germany and Italy, which was established in parts of Axis-occupied Yugoslavia. The NDH was founded on 10 April 1941, after the invasion of Yugoslavia by the Axis powers. The NDH consisted of modern-day Croatia and most of Bosnia and Herzegovina, as well as some parts of modern-day Serbia and Slovenia. The regime targeted Serbs, Jews, Roma people and anti-fascist or dissident Croatians and Muslims, as part of a large-scale genocide campaign in places such as the Jasenovac concentration camp. In its judgement in the Hostages Case, the Nuremberg Military Tribunal concluded that NDH was not a sovereign state. According to the Tribunal, "Croatia was at all times here involved an occupied country". 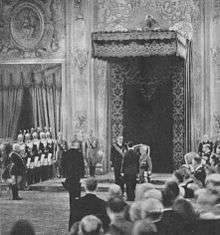 The state was officially a monarchy since the signing of the Laws of the Crown of Zvonimir on 15 March 1941. and an Italian protectorate from the signing of the Treaties of Rome on 18 May 1941 until the Italian capitulation on 8 September 1943. Appointed by Victor Emmanuel III of Italy, Prince Aimone, Duke of Aosta initially refused to assume the crown in opposition to the Italian annexation of the Croat-majority populated region of Dalmatia. He later accepted the throne upon being pressured to do so by Victor Emmanuel III and was titled Tomislav II of Croatia, but never moved from Italy to reside in Croatia. 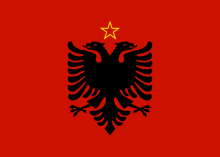 The state was actually controlled by the governing fascist Ustaše movement and its Poglavnik,[note 1] Ante Pavelić. For its first two years up to 1943, the state was also a territorial condominium of Germany and Italy. Central Dalmatia was annexed directly into Italian territory as part of the irredentist agenda of an Italian Mare Nostrum ("Our Sea"). In 1942, Germany suggested Italy take military control of all of Croatia out of a desire to redirect German troops from Croatia to the Eastern Front. Italy however rejected the offer as it did not believe that Italy alone could handle the unstable situation in the Balkans. After the ousting of Mussolini and the Kingdom of Italy's armistice with the Allies, the NDH on 10 September 1943 declared that the Treaties of Rome of 18 May 1941 with the Kingdom of Italy were null and void and annexed the portion of Dalmatia that had been annexed from Yugoslavia to the Kingdom of Italy in the Treaties of Rome. 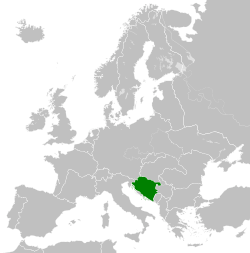 The NDH attempted to annex Zara, which had been a recognized territory of Italy since 1919 but long an object of Croatian irredentism. Germany did not allow it, however. Between 1941–45, 22 concentration camps, two of which (Jastrebarsko and Sisak) housed only children, existed inside the territory controlled by the Independent State of Croatia, and were occupied by Serbs, Jews, Roma, and anti-fascist or dissident Croats and Muslims. When compared to the republican borders established in the SFR Yugoslavia after the war, the NDH encompassed the whole of Bosnia and Herzegovina, with its non-Croat (Serb and Bosniak) majority, as well as some 20 km² of Slovenian (villages Slovenska vas near Bregana, Nova vas near Mokrice, Jesenice in Dolenjsko, Obrežje and Čedem) and the whole of Syrmia (part of which was previously in the Danube Banovina). The highest level of administration were the great parishes (Velike župe), each of which was headed by a Grand Župan. After the capitulation of Italy, NDH were permitted by the Germans to annex parts of the areas of Yugoslavia previously occupied by Italy. To accommodate this, parish boundaries were changed and the new parish of Sidraga-Ravni Kotari was created. In addition on 29-10-43 the Kommissariat of Sušak-Krk (Croatian: Građanska Sušak-Rijeka) was created separately by the Germans to act as a buffer zone between the NDH and RSI in the Fiume area in order to "perceive the special interests of the local population against the italians"
In 1915 a group of political emigres from Austria-Hungary, predominantly Croats but including some Serbs and a Slovene, formed themselves into a Yugoslav Committee, with a view to creating a South Slav state in the aftermath of World War I. They saw this as a way to prevent Dalmatia being ceded to Italy under the Treaty of London (1915). 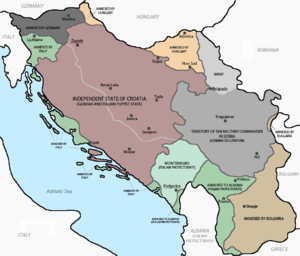 In 1918, the National Council of Slovenes, Croats and Serbs sent a delegation to the Serbian monarch to offer unification of the State of Slovenes, Croats and Serbs with the Kingdom of Serbia. The leader of the Croatian Peasant Party, Stjepan Radić, warned on their departure for Belgrade that the council had no democratic legitimacy. But a new state, the Kingdom of Serbs, Croats and Slovenes, was duly proclaimed on 1 December 1918, with no heed taken of legal protocols such as the signing of a new Pacta conventa in recognition of historic Croatian state rights. Croats were at the outset politically disadvantaged with the centralized political structure of the kingdom, which was seen as favouring the Serb majority. The political situation of the Kingdom of Serbs, Croats, and Slovenes was fractious and violent. In 1927, the Independent Democratic Party, which represented the Serbs of Croatia, turned its back on the centralist policy of King Alexander. On 20 June 1928, Stjepan Radić and four other Croat deputies were shot while in the Belgrade parliament by a member of the Serbian People's Radical Party. Three of the deputies, including Radić, died. The outrage that resulted from the assassination of Stjepan Radić threatened to destabilise the kingdom. In January 1929, King Alexander responded by proclaiming a royal dictatorship, under which all dissenting political activity was banned and renaming the state the "Kingdom of Yugoslavia". The Ustaša was created in principle in 1929. Acceding to the demands of Benito Mussolini and the Fascist regime in the Kingdom of Italy, Pavelić reluctantly accepted Aimone the 4th Duke of Aosta as a figurehead King of the NDH under his new royal name, Tomislav II. Tomislav II never visited the NDH and had no influence over the government, which was dominated by Pavelić. Tomislav II was not interested in being the figurehead King of Croatia. Upon learning he had been named King of Croatia, he told close colleagues that he thought his nomination was a bad joke by his cousin King Victor Emmanuel III though he accepted the crown out of a sense of duty. 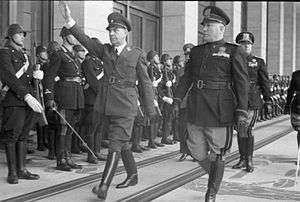 Italian Fascist dictator Benito Mussolini and Ante Pavelić had close relations prior to the war. Mussolini and Pavelić both despised the Kingdom of Yugoslavia. Italy had been promised, in the Treaty of London (1915), that it would receive Dalmatia from Austria-Hungary at the end of World War I. The peace negotiations in 1919, however, influenced by the Fourteen Points proclaimed by US President Woodrow Wilson (1856–1924), called for national self-determination and determined that the Yugoslavs rightfully deserved the territory in question. Italian nationalists were enraged. Italian nationalist Gabriele D'Annunzio raided Fiume (which held a mixed population of Croats and Italians) and proclaimed it part of the Italian Regency of Carnaro. D'Annunzio declared himself "Duce" of Carnaro and his blackshirted revolutionaries held control over the town. D'Annunzio was known for engaging in passionate speeches aimed to draw Croatian nationalists to support his actions and to oppose Yugoslavia. 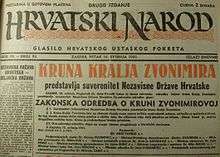 Croatian nationalists, such as Pavelić, opposed the border changes that occurred after World War I. Not only was D'Annunzio's symbolism copied by Mussolini but also D'Annunzio's appeal to Croatian support for the dismantling of Yugoslavia was copied and implemented as a foreign policy approach to Yugoslavia by Mussolini. Pavelić had been in negotiations with Italy since 1927 that included advocating a territory-for-sovereignty swap in which he would tolerate Italy annexing its claimed territory in Dalmatia in exchange for Italy supporting the sovereignty of an independent Croatia. In the 1930s, upon Pavelić and the Ustaše being forced into exile by the Yugoslav government, Mussolini offered Pavelić and the Ustaše sanctuary in Italy and allowed them to use training grounds to prepare for war against Yugoslavia. In exchange for this support, Mussolini demanded that Pavelić agree that Dalmatia would become part of Italy if Italy and the Ustaše successfully waged war on Yugoslavia. Although Dalmatia was a largely Croat-populated territory, it had been part of various Italian states, such as the Roman Empire and the Republic of Venice in prior centuries and was part of Italian nationalism's irredentist claims. In exchange for this concession, Mussolini offered Pavelić the right for Croatia to annex all of Bosnia and Herzegovina, which had only a minority Croat population. Pavelić agreed to this controversial exchange. After the invasion and occupation of Yugoslavia, Italy annexed numerous Adriatic islands and a portion of Dalmatia, which all combined to become the Italian Governorship of Dalmatia including territory from the provinces of Split, Zadar, and Kotor. 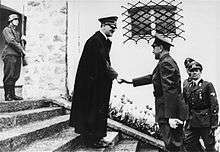 Germany's Führer Adolf Hitler (left) with Poglavnik Ante Pavelić (right) at the Berghof outside of Berchtesgaden, Germany. The invasion was precipitated by the need for German forces to reach Greece to save Italian forces, which were failing on the battlefield against the Greek armed forces. Upon rescuing Italian forces in Greece and having conquered Yugoslavia and Greece almost single handedly, Hitler became frustrated with Mussolini and Italy's military incompetence. Germany improved relations with the Ustaše and supported the NDH claims to annex the Adriatic Coast in order reduce Italy's planned territorial gains. Nevertheless, Italy annexed a significant central portion of Dalmatia and various Adriatic Islands. This was not what had been agreed with Pavelić prior to the invasion; Italy had expected to annex all of Dalmatia as part of its irredentist claims. — Gestapo report to Reichsführer SS Heinrich Himmler, 17 February 1942. According to reports by General Glaise-Horstenau, Hitler was angry with Pavelić, whose policy inflamed the rebellion in Croatia, thwarting any prospect of deploying NDH forces on the Eastern Front. Moreover, Hitler was forced to engage large forces of his own to keep the rebellion in check. For that reason, Hitler summoned Pavelić to his war headquarters in Vinnytsia (Ukraine) on 23 September 1942. Consequently, Pavelić replaced his minister of the Armed Forces, Slavko Kvaternik, with the less zealous Jure Francetić. Kvaternik was sent into exile in Slovakia – along with his son Eugen, who was blamed for the persecution of the Serbs in Croatia. 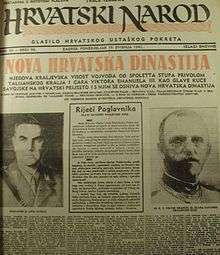 Before meeting Hitler, to appease the public, Pavelić published an "Important Government Announcement" (»Važna obavijest Vlade«), in which he threatened those who were spreading the news "about non-existent threats of disarmament of the Ustashe units by representatives of one foreign power, about the Croatian Army replacement by a foreign army, about the possibility that a foreign power would seize the power in Croatia ..."
The Ustaše gained German support for plans to eliminate the Serb population in Croatia. One plan involved an exchange in 1941 between Germany and the NDH, in which 20,000 Catholic Slovenes would be deported from German-held Slovenia and sent to the NDH where they would be assimilated as Croats. In exchange, 20,000 Serbs would be deported from the NDH and sent to the rump Serbian State. On the meeting with Hitler on 6 June 1941 in Salzburg, Pavelić agreed to receive 175,000 deported Slovenes. The agreement provided that the number of Serbs deported from NDH to Serbia could exceed the number of Slovenes received by 30,000. During the talks, Hitler stressed the necessity and desirability of deportations of Slovenes and Serbs, and advised Pavelic that NDH, in order to become stable, should carry on ethnically intolerant policy for the next 50 years. The German occupation forces allowed the expulsion of Serbs to Serbia, but instead of sending the Slovenes to Croatia, they were also deported to Serbia. In total, about 300,000 Serbs had been deported or fled from the NDH to Serbia by the end of World War II. The Ustaše's genocidal onslaught on its minorities provoked mass movements of resistance, inspired in part by royalist (Četnik) and – more effectively – communist (Partisan) ideologies, but driven primarily by a determination to fight back by any means. The uprisings were particularly strong in rural areas where many village populations fled from the terror and then mounted guerilla operations from vantage points in the mountains and forests. On 22 June 1941, the Sisak Partisan Detachment was formed in Brezovica forest near Sisak; this was to be celebrated as the first armed resistance unit formed in occupied Europe during World War II. Croats, Serbs, Bosniaks, and citizens of all nationalities and backgrounds began joining the pan-Yugoslav Partisans led by Josip Broz Tito. The Partisan movement was soon able to control a large percentage of the NDH (and Yugoslavia) and before long the cities of occupied Bosnia and Dalmatia in particular were surrounded by these Partisan-controlled areas, with their garrisons living in a de facto state of siege and constantly trying to maintain control of the rail-links. In 1944, the third year of the war in Yugoslavia, Croats formed 61% of the Partisan operational units originating from the Federal State of Croatia. Tomislav II formally renounced his title in October 1943 after the birth of his son, Amedeo, to whom he gave, amongst his middle names, the name 'Zvonimir'. Tomislav II's full title was "King of Croatia, Prince of Bosnia and Herzegovina, Voivode of Dalmatia, Tuzla and Knin, Duke of Aosta (from 1942), Prince of Cisterna and of Belriguardo, Marquess of Voghera, and Count of Ponderano". The NDH Parliament was established by the Legal Decree on the Croatian State Parliament on 24 January 1942. The parliament members were not elected and meetings were convened just over a dozen times after the initial session in 1942. Its president vas Marko Dosen. This decree established five categories of individuals who would receive an invitation to be a member of parliament from the Ustaše-appointed government: (1) living Croatian representatives from the Croatian Parliament of 1918, (2) living Croatian representatives elected in the 1938 Yugoslavian elections, (3) members of the Croatian Party of Rights prior to 1919, (4) certain officials of the Supreme Ustaše Headquarters and (5) two members of the German national assembly. The responsibility for assembling all eligible members of parliament was given to the head of the Supreme Court, Nikola Vukelić, who found 204 people to be eligible. In accordance with the decree, Vukelić ruled that those who had received the position of senator in 1939, had been part of Dušan Simović's government, or had been part of the Yugoslav government-in-exile forfeited their eligibility. Two hundred and four people were declared eligible for the parliament, with 141 actually attending parliamentary meetings. Of the 204 eligible parliament members, 93 were members of the Croatian Peasant Party, 56 of whom attended meetings. The Parliament was only a deliberatory body and was not empowered to enact legislation. However, during the eighth session of the parliament in February 1942, the Ustaše regime was put on the defensive when a joint Croatian Peasant Party-Croatian Party of Rights motion, supported by 39 members of parliament, questioned about the whereabouts of the Peasant Party's leader Vladko Maček. The following session, Ante Pavelić responded that Maček was being kept in isolation to prevent him from coming into contact with Yugoslav government officials. In less than a month, Maček was moved from the Jasenovac concentration camp and put on house arrest at his property in Kupinec. Maček was later called upon by foreigners to take a stand and counteract the Pavelić government, but he refused. Maček fled the country in 1945, with the help of Ustaše General Ante Moškov. After its February 1942 session, the Parliament met only a few more times, and the decree was not renewed in 1943. The NDH founded the Army of the Independent State of Croatia (Serbo-Croatian: Hrvatsko domobranstvo) and Navy of the Independent State of Croatia in April 1941 with the consent of the German armed forces (Wehrmacht). The task of the armed forces was to defend the state against both foreign and domestic enemies. The Army included an air force. 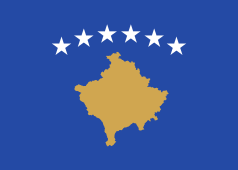 The NDH also created the Ustaška Vojnica (Ustaše militia) which was conceived as a party militia, and a gendarmerie. The Air Force of the Independent State of Croatia provided some level of air support (attack, fighter and transport) right up until May 1945, encountering and sometimes defeating opposing aircraft from the British Royal Air Force, United States Air Force and the Soviet Air Force. The final deliveries of up-to-date German Messerschmitt 109G and K fighter aircraft were still taking place in April 1945. By the end of March 1945, it was obvious to the Croatian Army Command that, although the front remained intact, they would eventually be defeated by sheer lack of ammunition. For this reason, the decision was made to retreat into Austria, in order to surrender to the British forces advancing north from Italy. The German Army was in the process of disintegration and the supply system lay in ruins. The German zone, which included the northeastern part of NDH, bordering Hungary in the north, German-occupied Serbia in the east, the Italian zone in the south, and Nazi Germany in the north-west. There, the German armed forces (Wehrmacht) exercised de facto control. The Italian zone, which included the southwestern part of the NDH, bordering the German zone in the north-east, Italian-occupied Montenegro in the east, and Yugoslav territories annexed by Italy in the south-west. After the capitulation of Italy in 1943, the Italian zone of influence was abolished and the German zone of influence was expanded to the whole Independent State of Croatia.At the same time, the NDH acquired control of northern Dalmatia (Split and Šibenik). 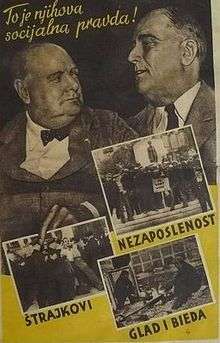 The economic system of NDH was based on the concept of "Croatian socialism". The main characteristics of this system, which followed the one of Nazi Germany, were the principles of a planned economy, with high levels of state involvement in economic life. The state aimed to place the means of production in the hands of the peasants and create a psychic unity among all classes and estates to work for the greater good of the national community, which was seen as more important than individual rights. Croatian socialism contended that work was not a private matter, but the source of all economic worth and the property of the community. At the beginning of 1942 the government introduced compulsory work service for all citizens between the age of 18 and 25. Up to that time around 7,55 billion Yugoslav dinars were replaced by the NDH kuna at an exchange rate of 1 dinar for 1 kuna. The government kept printing money and its amount in circulation was rapidly increasing, resulting in high inflation rates. By the end of 1943 there were 43,6 billion kunas in circulation and in August 1944 76,8 billion. Constant money printing was a way of financing huge government spending, that could not be covered by increased taxation and long-term borrowing. The NDH inherited 42% or 32,5 million reichsmarks of the total debt Yugoslavia owed to Germany. According to official data, the total debt of NDH on clearing accounts at the end of 1944 amounted to 969,8 million kunas. Economic branches of which NDH had most revenue (collected through direct and indirect taxes) included industry, trade and crafts. Around 20% of state's industrial enterprises accounted for wood industry. However, as the war progressed, industrial production in the territory of NDH was constantly decreasing, while inflation continued growing. In 1942 80% of NDH exports went to Germany (including Austria, Protectorate of Bohemia and Moravia and the Polish General Government) and 12% to Italy. Germany covered 70% of imports, while Italy covered 25%. Other trade partners included Hungary, Romania, Finland, Serbia and Switzerland. Exports from NDH mainly consisted of lumber and wood products, agricultural products (including tobacco), livestock, ore, and strategically important bauxite. NDH mostly imported machinery, tools and other metal products, textiles and fuel. The region of the NDH controlled by Italy had few natural resources and little industry. There were some important timber stands, several cement plants, an aluminium plant at Lozovac, a carbide and chemical fertilizer plant at Dugi Rat, and a ferromanganese and cast iron plant near Šibenik, ship building operations in Split, a few brown coal mines supplying fuel to railways, shipping and industry, and rich bauxite fields. A large number of people were displaced due to internal fighting within the former Yugoslav kingdom. The NDH had to accept more than 200,000 Slovenian refugees who were forcefully evicted from their homes as part of the German plan of annexing parts of the Slovenian territories. As part of this deal, the Ustaše were to deport 200,000 Serbs from Croatia military regions; however, only 182,000 had been deported when German high commander Bader stopped this mass transport of people because of the uprising of Chetniks and partisans in Serbia. 25,000 Slovenian refugees ended in Serbia. An estimated 320,000–340,000 Serbs, 30,000 Croatian Jews and 30,000 Roma were killed during the NDH, including between 77,000–99,000 Serbs, Bosniaks, Croats, Jews and Roma killed in the Jasenovac concentration camp and the same number of Serbs were forced out of the NDH. Although the Ustase's main target for persecution were the Serbs, it also participated in the destruction of the Jewish population. The NDH deviated from Nazi anti-Semitic policy by promising honorary Aryan citizenship to some Jews, if they were willing to enlist and fight for the NDH. The number of Croats killed in the NDH is estimated to be approximately 200,000, either by the Ustase regime, as members of the armed resistance, or as Axis collaborators. Soon after establishment of the NDH, the Yugoslav Academy of Science and Arts in Zagreb was renamed the Croatian Academy of Sciences and Arts. The country had four state theatres: Zagreb, Osijek, Dubrovnik and in Sarajevo. The Croatian State Theatre in Zagreb played host to the Berlin Philharmonic and the Teatro dell'Opera di Roma in the 1941–42 season. Volumes two to five of Mate Ujević's Croatian Encyclopedia were published during this period. The Velebit Publishing House (Nakladna knjižara "Velebit"), named for the Velebit uprising, published pro-Axis works, including Japanac o Japanu [A Japanese on Japan] by the Japanese chargé d'affaires, Kazuichi Miura. The NDH was represented at the 1942 Venice Biennale, where the works of Joza Kljaković, Ivan Meštrović, Ante Motika, Ivo Režek, Bruno Bulić, Josip Crnobori, Antun Medić, Slavko Kopač and Slavko Šohaj were presented by Vladimir Kirin. The most popular sport in the NDH was football, which had its own league system, with the highest level known as the Zvonimir Group, with eight teams in 1942–43 and 1943–44. Top clubs included Građanski Zagreb, Concordia Zagreb and HAŠK. 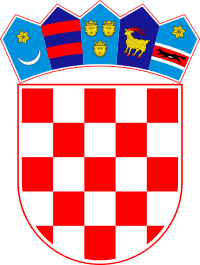 The Croatian Football Federation was accepted into FIFA on 17 July 1941. The NDH national football team played 14 "friendly" matches against other Axis nations and puppet states between June 1941 and April 1944, winning five. The Croatian Table-Tennis Association organized a national competition as well as a national team which participated in a few international matches. The Croatian Olympic Committee was recognized as a special member of the International Olympic Committee, with Franjo Bučar acting as its representative. The Croatian Skiing Association organized a national championship, held on Zagreb's Sljeme mountain. A national bowling competition was held in 1942 in Zagreb which was won by Dušan Balatinac. ↑ "Poglavnik" was a term coined by the Ustaše, and it was originally used as the title for the leader of the movement. In 1941 it was institutionalized in the NDH as the title of first the Prime Minister (1941–43), and then the head of state (1943–45). It was at all times held by Ante Pavelić (1889 – 1959) and became synonymous with him. The translation of the term varies. The root of the word is the Croatian word "glava", meaning "head" ("Po-glav(a)-nik"). The more literal translation is "head-man", while "leader" captures more of the meaning of the term (in relation to the German "Führer" and Italian "Duce"). ↑ Ramet 2006, p. 118. ↑ "Independent State of Croatia". Britannica Online Encyclopedia. Retrieved 8 September 2009. ↑ "Croatia". Microsoft Encarta Online Encyclopedia. Retrieved 8 September 2009. ↑ "Yugoslavia". Holocaust Encyclopedia. United States Holocaust Memorial Museum. Retrieved 8 September 2009. Archived 31 October 2009. 1 2 Fischer, Bernd J., ed. (2007). Balkan Strongmen: Dictators and Authoritarian Rulers of South-Eastern Europe. Purdue University Press. pp. 207–08, 210, 226. ISBN 978-1-55753-455-2. ↑ "Jasenovac". Jewishvirtuallibrary.org. Retrieved 3 June 2011. ↑ Deutschland Military Tribunal 1950, pp. 1302–03. ↑ Tomasevich, 2001, p. 60. "Thus on 15 April 1941, Pavelić came to power, albeit a very limited power, in the new Ustasha state under the umbrella of German and Italian forces. On the same day German Führer Adolf Hitler and Italian Duce Benito Mussolini granted recognition to the Croatian state and declared that their governments would be glad to participate with the Croatian government in determining its frontiers." ↑ Graubard, Stephen R. (1993). Exit from Communism. p. 153. Transaction Publishers; ISBN 1-56000-694-3. "Mussolini and Hitler installed the Ustašas in power in Zagreb, making them the nucleus of a dependent regime of the newly created Independent State of Croatia, an Italo-German condominium predicated on the abolition of Yugoslavia." 1 2 Frucht, Richard C. (2005). Eastern Europe: An Introduction to the People, Lands, and Culture. p. 429. ABC-CLIO; ISBN 1-57607-800-0. "The NDH was in fact an Italo-German condominium. Both Nazi Germany and fascist Italy had spheres of influence in the NDH and stationed their own troops there." ↑ Banac, Ivo (1988). With Stalin Against Tito: Cominformist Splits in Yugoslav Communism. Cornell University Press, pg. 4; ISBN 0-8014-2186-1. 1 2 Jozo Tomašević. War and Revolution in Yugoslavia, 1941–1945: Occupation and Collaboration: 1941–1945: Occupation and Collaboration. Stanford University Press, 2001. pg. 300. ↑ Jonathan Steinberg. All Or Nothing: The Axis and the Holocaust, 1941–1943. p. 44. ↑ Listing of WWII concentration camps by country, jewishvirtuallibrary.org; accessed 4 December 2015. ↑ Concentration camps other than Jasenovac in the Independent State of Croatia, holocaustresearchproject.org; accessed 4 December 2015. ↑ "Rise and fall of the NDH". Retrieved 3 June 2011. 1 2 "Gospodarstvo Nezavisne Države Hrvatske 1941–1945. (1)" [Business of the Independent State of Croatia] (in Croatian). Retrieved 15 April 2014. 1 2 3 Kisić-Kolanović, Nada. Mladen Lorković-ministar urotnik, Golden Marketing, Zagreb (1997), pp. 304–06. ↑ Sečen, Ernest (16 April 2005). "Mejo so zavarovali z žico in postavili mine" [They Protected the Border with Wire and Set up Mines]. Dnevnik.si (in Slovenian). ↑ Pusić, Eugen. Hrvatska središnja državna uprava i usporedni upravni sustavi. Školska knjiga, Zagreb 1997 (p. 173). ↑ Ein General im Zwielicht, Memoirs of General Edmund Glaise von Horstenau, vol 76, p. 307, books.google.com; accessed 4 December 2015. ↑ "Ante Pavelić on Croatian". Moljac.hr. Retrieved 3 June 2011. ↑ Petacco, Arrigo (2005). A Tragedy Revealed: The Story of the Italian Population of Istria, Dalmatia, and Venezia Giulia. University of Toronto Press. pp. 26–27. ISBN 0-8020-3921-9. ↑ "Foreign News: Crown of Zvonimir". TIME. 26 May 1941. Retrieved 3 June 2011. ↑ Tomasevich, Jozo. : War and Revolution in Yugoslavia: 1941-1945; retrieved 16 July 2016. ↑ Tomasevich, Jozo. War and Revolution in Yugoslavia 1941-1945. pp. 381–82. ↑ Bosworth, Richard J. B. 2005. Mussolini's Italy. New Work: Allen Lane. pp. 112–13. ↑ Bernd Jürgen Fischer (ed.). Balkan strongmen: dictators and authoritarian rulers of South Eastern Europe. Purdue University Press, 2007, p. 210. 1 2 Rodogno, Davide. Fascism's European empire: Italian occupation during the Second World War, Cambridge University Press, UK (2006), pp. 80–81. ↑ Hrvatski narod, 3 September 1942. ↑ Georg Lepre, Himmler's Bosnian Division, pg. 17. ↑ Krizman 1980, pp. 47–49. ↑ Pyle, Christopher H. Extradition, politics, and human rights, Temple University Press, 2001; ISBN 1-56639-823-1; pg. 132. ↑ Strugar, Vlado (1969). Jugoslavija 1941–1945. Vojnoizdavački zavod. ↑ Anić, Nikola; Joksimović, Sekula; Gutić, Mirko (1982). Narodnooslobodilačka vojska Jugoslavije. Vojnoistorijski institut. ↑ Vuković, Božidar; Vidaković, Josip (1976). Putevim Glavnog štaba Hrvatske. ↑ "The Political Economy of Pension Reforms in Croatia 1991–2006". Retrieved 3 June 2011. ↑ "Ugovor između Vlade Republike Hrvatske i Vlade Savezne Republike Njemačke o njemačkim ratnim grobovima u Republici Hrvatskoj – (Uredba o potvrđivanju Ugovora između Vlade Republike Hrvatske i Vlade Savezne Republike Njemačke o njemačkim ratnim grobovima u Republici Hrvatskoj, NN-MU 017/1997)". Narodne novine (in Croatian) (17/1997). Retrieved 23 July 2012. ↑ "Duke gives up puppet throne". St. Petersburg Times. 21 August 1943. p. 10. ↑ Lemkin, Raphael; Power, Samantha (2005). Axis Rule In Occupied Europe: Laws Of Occupation, Analysis Of Government, Proposals For Redress. Lawbook Exchange. p. 253. ISBN 1584775769. ↑ "Foreign News: Hotel Balkania". Time Magazine. 9 August 1943. Retrieved 4 December 2009. ↑ Ben Cahoon. "Croatia". Worldstatesmen.org. Retrieved 3 June 2011. ↑ "Royal House of Italy". European royal houses. Archived from the original on 15 April 2008. ↑ "Pravni fakultet Split – Zbornik". Pravst.hr. Retrieved 3 June 2011. ↑ Kovačić, Darko. Penal legislation and the system of penitentiaries and correctional institutions in the Independent State of Croatia, 2008. ↑ Lisko, et al., 1998, p. 34. 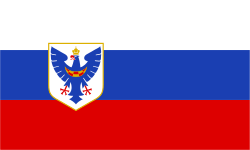 ↑ The history of Slovenske železnice Archived 17 September 2008 at the Wayback Machine. ↑ "Organization of the Croatian State Railways". Retrieved 3 June 2011. ↑ Baumann, Gawrych & Kretchik 2012, p. 13. ↑ Bosworth, R.J.B. (2009). The Oxford Handbook of Fascism. Oxford University Press. p. 431. ISBN 978-0-19-929131-1. ↑ Hersch Lauterpacht (1957). International Law Reports. Cambridge University Press. p. 57. ISBN 0-521-46366-1. ↑ "Makeup of Croatian State Railways". Retrieved 3 June 2011. ↑ "History of the Croatian Red Cross". Hck.hr. Retrieved 3 June 2011. 1 2 Kevo, Mario. Posjet poslanika Međunarodnog odbora Crvenog križa logorima Jasenovac i Stara Gradiška u ljeto 1944. ↑ "Kaznenopravni i povijesni aspekti Bleiburškog zlocina" (PDF). Retrieved 3 June 2011. 1 2 Hoare, Marko Attila (2006). Genocide and Resistance in Hitler's Bosnia: The Partisans and the Chetniks. Oxford University Press. pp. 19–20. ISBN 0-19-726380-1. 1 2 "Independent State of Croatia laws on Croatian – Zakonske osnove progona politickih protivnika i rasno nepodobnih u NDH" (PDF). Retrieved 3 June 2011. ↑ Goldstein, Ivo. "Jews in Yugoslavia 1918–41: Antisemitism and the Struggle for Equality" (PDF). Central European University. Retrieved 7 February 2010. ↑ "United States Holocaust Memorial Museum about Jasenovac and Independent State of Croatia". Ushmm.org. Archived from the original on 16 September 2009. Retrieved 3 June 2011. ↑ Riesman, Philip J. Cohen; foreword by David (1996). Serbia's secret war: propaganda and the deceit of history (4. printing ed.). Texas: A&M University Press. ISBN 978-0-89096-760-7. ↑ Kočović, Bogoljub (2005). Sahrana jednog mita: žrtve Drugog svetskog rata u Jugoslaviji. Beograd: Otkrovenje. ISBN 978-86-83353-39-2. ↑ Dubravka Velat, Stanovništvo Jugoslavije u posleratnom periodu /Population in Yugoslavia in the post-war Period/ (Belgrade: SZS, 1988), p. 141. Cited in Projekat Rastko. 1 2 Dr. Branislav Bukurov, Bačka, Banat i Srem, Novi Sad, 1978. ↑ "Matica hrvatska – Povratak zaboravljene glumice". Matica.hr. 16 November 2001. Retrieved 3 June 2011. ↑ Kazalište u Dubrovniku do osnutka prvoga profesionalnog ansambla Archived 20 March 2008 at the Wayback Machine. ↑ Popular practice of national music during the Second World War Archived 11 June 2007 at the Wayback Machine. ↑ "Povijesni pregled Zavoda za mikrobiologiju Farmaceutsko-biokemijskog fakulteta Sveučilišta u Zagrebu". Pharma.hr. Archived from the original on 24 May 2010. Retrieved 3 June 2011. ↑ Medical Faculty of Sarajevo University Mission Statement Archived 13 February 2008 at the Wayback Machine. ↑ "The Oldest Attempt of Film Education in Croatia: Zagreb Film Schools 1917–1947". Hfs.hr. Retrieved 3 June 2011. ↑ "Filmological Research in the Vienna Film Archive 2004". Retrieved 3 June 2011. ↑ Oktavijan Miletic profile, IMDB.com; accessed 4 December 2015. ↑ "Projekt Marijana Haberlea za Provincijalat franjevaca konventualaca u Sisku iz 1943. godine". Retrieved 3 June 2011. ↑ "Hrvatska znanstvena bibliografija – Prikaz rada". Bib.irb.hr. 14 May 2010. Retrieved 3 June 2011. ↑ Parašcic, Ivan. Cenzura u Jugoslaviji od 1945. do 1990. godine, University of Zagreb (2007), pg. 15. 1 2 "History of Radio in Croatia". Free-sk.htnet.hr. Retrieved 3 June 2011. ↑ "Tomislav Group". Nk-maksimir.hr. Retrieved 3 June 2011. ↑ "About the HNS". Hns-cff.hr. Retrieved 3 June 2011. ↑ "Fixtures and Results". FIFA. Retrieved 31 October 2012. ↑ "History of Handball". Hrs.hr. Retrieved 3 June 2011. ↑ Olymp, October 2006 Archived 30 June 2007 at the Wayback Machine. ↑ History of Croatian table-tennis Archived 4 May 2007 at the Wayback Machine. ↑ "History of Croatian Olympic Movement". Index.hr. Retrieved 3 June 2011. ↑ 110 years of skiing in Zagreb Archived 6 July 2007 at the Wayback Machine. ↑ "Osječki spomendan 12. travnja". osijek.hr (in Croatian). City of Osijek. 12 April 2011. Retrieved 18 April 2012. Deutschland Military Tribunal (1950). Trials of war criminals before the Nuernberg Military Tribunals under Control Council Law no. 10 : Nuernberg Oct. 1946 – April 1949 Vol. 11 The High Command case. The Hostage case. Case 12. US v. von Leeb. Case 7. US v. List. Washington: United States Government Printing Office. OCLC 247746272.